In most countries, when you meet someone for the first time, a good ice breaker is to talk about the weather. But in Dubai, since the weather rarely changes, it doesn’t provide for much conversation. Because Dubai has a huge expat community with many different nationalities, many conversations instead begin with, “So where are you from?”. Random Person: So where are you from? Random Person: (Clearly unsatisfied with my answer) No. Where are you from? Random Person: (Growing more agitated) No. You do not look like an Indian. Where are you from? Random Person: (Not knowing what to say) OK.
1. Sometimes the “Random Person” is a South Asian person who has never left their native country before coming to Dubai, so they will just say “UK?” and the “Where are you from?” is only implied. So for example, they will see me and just say, “UK?”. After a couple of minutes, I will realize what they are talking about and go into my usual country list. 2. I can never tell if “Random Person” is asking about my nationality or ethnicity, so I might say “American” or “Indian” first, but whichever I say, they are still not satisfied with my answer. 3. If I am tired that day, I will just say “Mexican” in the beginning and then all conversation will cease as most people in this region don’t know too much about Mexico. If you are wondering why I chose Mexico, it is not only because I can pass for Mexican if needed, but mostly, because I love the food. Growing up in California, I was surrounded by Mexican culture and food, so Mexican cuisine has many flavors and ingredients I enjoy to eat and cook. 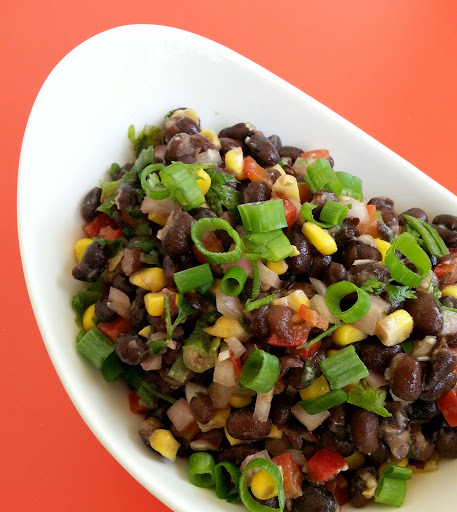 This black bean salad is inspired by the flavors of my adopted nationality. 1. Combine all ingredients in a large bowl and stir. Refrigerate for a couple of hours so all flavors come together. Serve chilled or at room temperature and garnish with more chopped green onion and coriander. NOTE: I prefer to put in refrigerator overnight as it tastes even better the next day. You can use this as a main dish or side salad or even as a filling in a taco or in a quesadilla – just add some cheese and melt inside a tortilla in a hot pan.